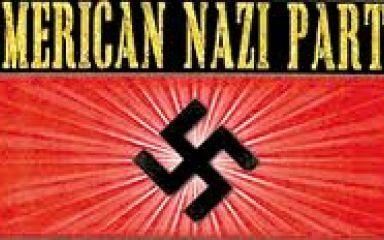 The American Nazi Party was founded in the U.S. by George Lincoln Rockwell in 1958. They pledged allegiance to the ideals of Nazi Germany and Adolf Hitler. Rockwell was assassinated by one of his members, John Patler, in 1967 over an internal party dispute, and was replaced by Matthias Koehl, who had previously been a founder of the National States Rights Party in 1958. The party changed its name in 1968 to the National Socialist White People's Party and set up headquarters in Arlington, Virginia. It is currently operating under the name of New Order in New Berlin, Wisconsin, where it aims to establish a "Nationalist Socialist community" called Nordland. It is not the same group as Dennis McGiffin's The New Order (see separate entry).VideoVideo: 2010 Rocky Suhayda speaks at the ANP rally in South Carolina on October 9th, 2010. American Nazi Party, also known as The World Union of Free Enterprise National Socialists (WUFENS), National Socialist White People's Party (NSWPP), New Order is an active group formed c. 1959.